Another sunny day means another day trip to go hiking or walking! To be honest, the weather has gotten cloudier in the last week or so, but there's still been warm, dry days to spend outside. I headed back to the Pentlands again at the weekend (having been a couple of months back), taking a friend with me who hadn't been before. 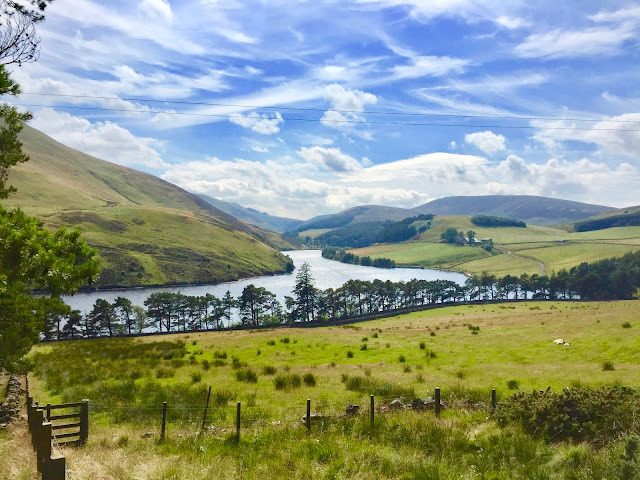 We weren't out to do a huge, tough hike, so I researched a route that was fairly easy, taking just an hour or two to walk, with minimal ascent, but where we could still get some good views, so we settled on the Glencorse Reservoir Walk. You can just explore the Pentlands without following a specific route, but we had time limitations to consider! It was a little tricky to get to the start of the route, as it's near Flotterstone Inn, which is easy enough to find, but the only bus route that goes that way is the Stagecoach 101, but there were diversions in place. The driver was very helpful though, and explained what we should do. He dropped us off as close as possible, and then we had to walk around 20 minutes on the pavement along the side of the road until we reached the inn itself. He also showed us where to get the bus coming back from, as we'd have to come back up the same way. The walking route was easy to find from there. There's a coffee stand and information point behind the inn, then we just followed the road round to the left, keeping an eye out for the Glencorse View signs as we went. The first part took us through some woodland, alongside a narrow burn (stream) running through the trees. Beyond the woods, to our right, was a field of cows, grazing in the sun. There is a herd of Highland cows in the Pentlands, but it depends where they're been let out to graze as to whether or not you'll see them - I haven't on either visit so far. Beyond the woods, there is a junction, and it actually doesn't matter too much which way you go, as the route is circular and loops back around to this point, but we stuck to the signposts and turned to the left, away from the field of cows. We passed by fields, still following the stream, where we saw some families with young children playing in the water. There are multiple gates throughout this route, especially around this point - don't let these deter you, you can pass through them, it's just important to close them again behind you, to not cause problems for the farmers whose animals graze in these fields. The ascent started soon after this, curving uphill through some more woodland, but this only takes around 5 minutes. Then the path rejoins a paved road (vehicles may appear so keep an eye out! ), which leads around to the Glencorse Reservoir itself. As it was such a nice day, there were many people out on the water in boats. We did consider how nice it would be to go swimming on a day like this, but we were unprepared for that option, and since it's Scotland, it would no doubt be freezing in the actual water. We made our way around the bank though, taking in the views, with the reservoir on the left and hillside on the right. Eventually, we found the next signpost, as we had to veer away from the road and take a narrow rocky path up the side of a forest. This was the steepest ascent of the route, but it didn't take more than 10 minutes to reach the top, as it's not a high viewpoint we were heading to. The exertion there was absolutely worth it though, as this viewpoint is the highlight of the entire route. We took a break there, sitting in the grass for a while to admire the stunning landscape before us, overlooking the reservoir and the surrounding hills and fields. It was a beautiful spot, and this is one of the many reasons that I like living in Edinburgh, since it's so convenient to reach these sorts of locations, just a half hour or so outside of the city. Once we'd rested for a while (and eaten our snacks!) we continued on, following the path around the hillside at the same height. You can head further into the centre of the Pentlands at this point, which we nearly did until we realised that this was taking us further away from the main road, and we didn't have time for that. Instead, you have to head away from the reservoir, back in the direction we'd come from, just higher up (don't go back down the rocky path). We wound our way along the hillside, passing by fields of sheep and lambs this time, and it eventually took us back downhill, on another fairly steep, rocky path, which eventually rejoined the main road. It was just a few more minutes along the road until we reached the same junction from earlier, next to the field of cows, and then we just had to retrace our steps back towards Flotterstone Inn and then up the main road to a bus stop that was actually in use. It turned out we'd have to wait an hour for the next one to come though (the 101 isn't as regular as the city centre bus services), but a quick internet search revealed that we could walk 15 minutes to the University Easter Bush Campus, and take a no.15 Lothian bus into the city again, which was a bit more frequent. That was just another stretch of pavement following a road, past more countryside, fields, and a few cottages here and there. All in all, it was a nice afternoon out in the sun, away from the busy city centre, and I was glad that my friend enjoyed her first visit to the Pentlands too - hopefully it won't be her last! This is a nice walking route for anyone not wanting something too strenuous, or with limited time on their hands - just make sure to be aware of the bus timetables! - and you can still get some fantastic views, even without climbing quite so high into the hills.